What is the ISO.CEILING Function? The ISO.CEILING function is a Math and Trigonometry functionFunctionsList of the most important Excel functions for financial analysts. This cheat sheet covers 100s of functions that are critical to know as an Excel analyst. It is one of the fifteen rounding functions of MS Excel. The function returns a number rounded up to the nearest integer or to the nearest multiple of significance. It works regardless if the number given is positive or negative. ISO.CEILING was introduced in MS Excel 2010 and hence is unavailable in earlier versions. Number (required argument) – It is the value that to be rounded. Significance (optional argument) – It is the optional multiple to which the number given will be rounded. 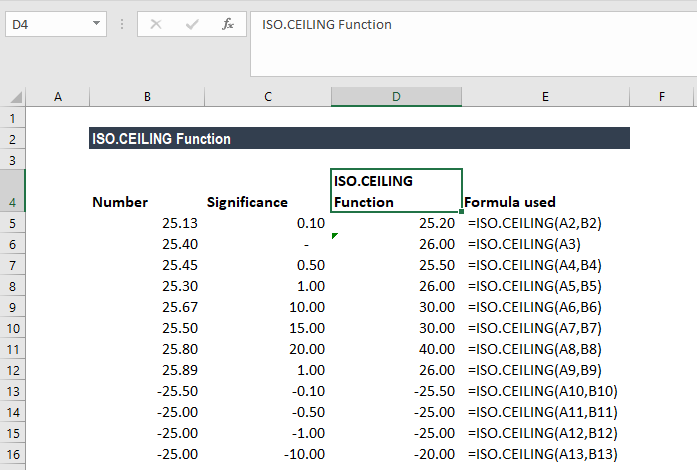 How to use the ISO.CEILING Function in Excel? As shown below, we took the number range -25 to 25.90 and used different significance values. When we gave the significance as 0.10, the function rounded off 25.13 to 25.2, which is the farthest 0. In the second example, we left the argument significance as blank so the function used 1. In the third example, we gave the significance as 0.5 so it rounded off to the nearest 0.5, which is 25.5. If the number is 25.55, it will round it off to 26. When we provided the significance as 1, it rounded it off to 26. Even if we provided 25.7, the function would round it off to 26. This is so as the function will round it off to the nearest multiple of 1. For rows 9, 10 and 11, the function rounded off the number to the nearest multiple of 10, 15 and 20. In row 13, when we gave the significance as -0.10, the function rounded 25.5 up to the nearest multiple of -0.1. If we omit the [significance] argument, it will take on the default value of 1. The ISO.CEILING function always rounds the supplied number up. For example, if the number given is positive, the function will round it up away from zero, and if the number given is negative, it will round it up towards zero. #VALUE! error – Occurs when we provide non-numeric values for one or both of the arguments.